Cross-country ski trails. Groves of flowering cherry trees. Bird-watching platforms. Art space. These can all be found among the nearly 100 concepts submitted for an 1.5-mile nature trail along the former DL&W elevated rail line between Canalside and RiverBend. There’s something for every season. Cross-country ski trails, narrow runs of ice for skating, and sledding berms for when it’s cold. Groves of flowering cherry trees, community gardens and a sand beach for when it’s warm. And bird-watching platforms, bicycle and walking paths and art space, no matter the season. 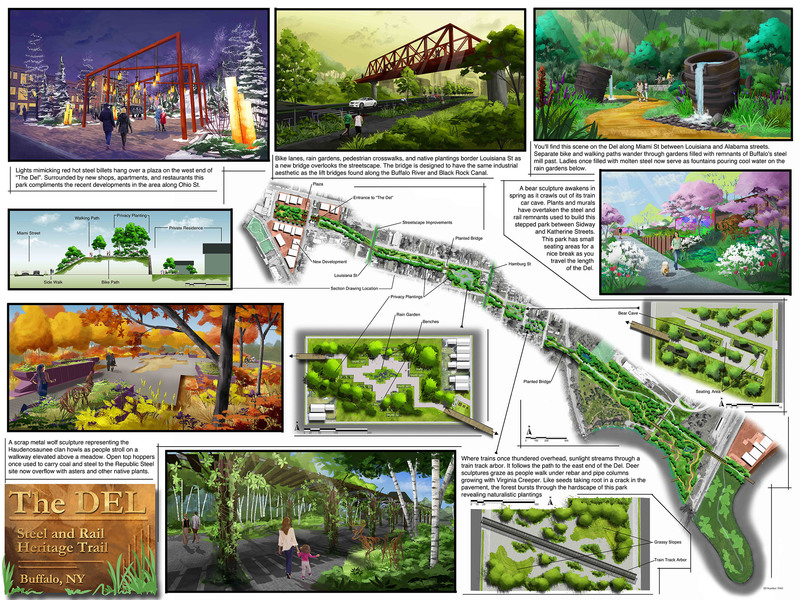 These are among the ideas from nearly 100 concepts submitted to the Western New York Land Conservancy, which is holding a design competition for an all-season 1.5-mile nature trail along the former DL&W elevated rail line between Canalside and RiverBend. “There are so many opportunities. It has really tremendous potential, tremendous opportunities,” said Ken Greenberg, a Toronto-based urban designer who’s serving as one of seven competition jurors. “This will be transformational for Buffalo,” Greenberg told The Buffalo News during a visit to Buffalo last week. The land conservancy on Wednesday will put the top designs up for a vote by the general public. An exhibition will be held from 6 to 8 p.m. at the M&T Center at Fountain Plaza in downtown Buffalo. But don’t confuse winning designs with what the finished project might eventually look like. Aspects of many of the conceptual designs are likely to be folded into the final project design. The conservancy hopes to craft a draft version of the park by fall 2020. “There will certainly be components of the winners, and of those that weren’t selected,” Rose-Burney said. It ties together the city’s rail and maritime histories. Part of its design modifies an oversized canal barge by separating it into three pieces along the corridor. It proposes a trail head park overlook out of the bow, a bridge from the midship and a nature center from the stern. Another part uses a ribbon of rails and wooden rail ties to create lighted public spaces that include a playground, picnic area and a spot for organic recycling. It includes connections to public transit as well as avenues for pedestrian and bicycle traffic amid a landscape of native canopy of trees, shrubs and pollinator-friendly plants. Besides an enclosed bridge overlooking the city’s rail yard, there’s also a meadow, a community garden and a sledding hill, too. Another intriguing design – named “The Del: Steel and Rail Heritage Trail” – uses historical design concepts that highlight the area’s pre-industrial roots. Artistic scrap metal sculptures of a wolf and an oversized turtle pay homage to the Haudenosaunee clan, of which the Seneca Nation was an original member. It proposes using open-top hoppers that once carried coal and steel to the nearby Republic Steel site as planters overflowing with small trees and plants. Ladles that once held orange-hot molten steel would be used as fountains that irrigate a rain garden. Nearby, a trellis of train tracks would be transformed into an arboretum of native plants and vines. There are also artistic murals, an elevated forest and riverwalk, spots for shops and restaurants and metal pedestrian bridges mirroring the industrial aesthetic of the corridor that tie the path together. Another design concept, dubbed “Greenware,” suggests crafting a “grand staircase” resembling some of the great parks of the 19th century. It establishes a park and native plant demonstration area with an open meadow areas for “pick-up games and neighborhood gatherings” as well as an over-sized picnic zone near Moore Street. Nature, in many ways, has already reclaimed the former DL&W elevated rail corridor. That’s mostly a good thing. It shows what can be accomplished after debris and invasive plant and tree species are removed. “Being at the site, you can start seeing potential,” said Ana Traverso-Krejcarek, manager of the High Line Network. Traverso-Krejcarek, a design competition juror, toured the corridor in recent weeks with other jurors. 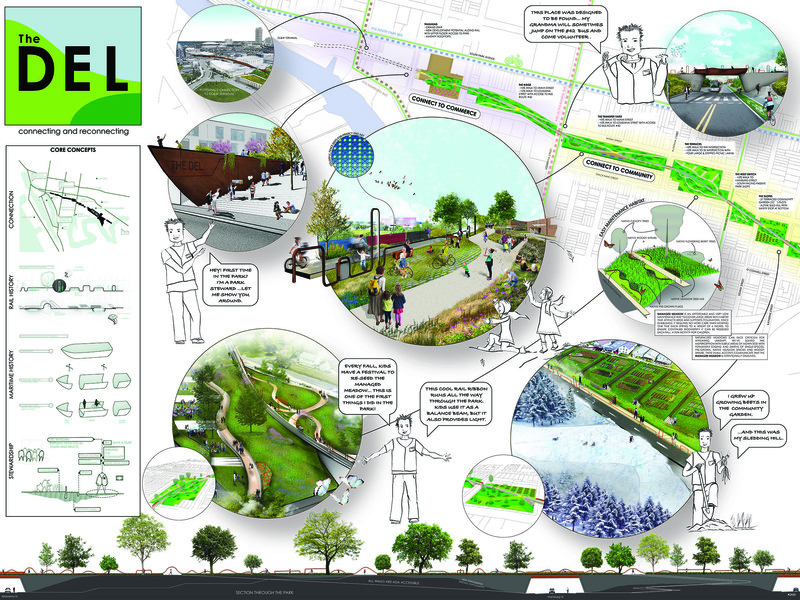 Her organization focuses on creating public spaces in post-industrial urban environments by refashioning infrastructure. The network has 19 projects across North America, including New York City’s High Line, the 606 in Chicago and the Bentway in Toronto. Could Buffalo become the network’s 20th project? That nature has a decadeslong head start makes the Buffalo project more distinctive from the other project sites using raw materials. “You don’t need to establish it; you just have to work with it,” said Kishore Varanasi, a Boston-based urban designer and the conservancy’s design ideas competition adviser. For Varanasi, the project will be about making “delicate touches” to the landscape rather than a wholesale transformation. Recognizing its place as part of Buffalo’s larger park system will also be important. “How do you come up with a suite of ideas that are as much about the breadth of the corridor as the length of the corridor?” Varanasi asked. That figures to include the Red Jacket River Front and Conway and River Fest parks. 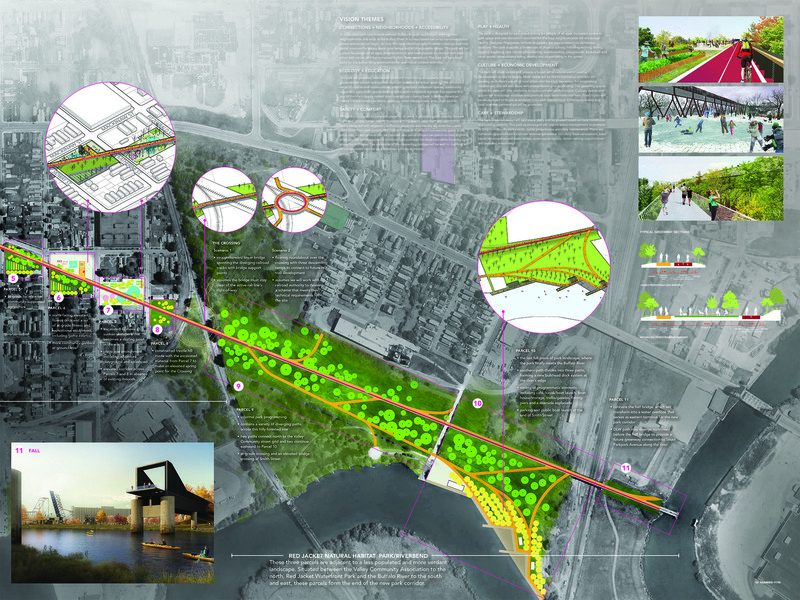 But experts also envision spokes extending outward, connecting with other public green space. Those connections will develop over time. “It’s not about how fast. It’s about how good,” said Robert Shibley, juror and dean of the University at Buffalo’s School of Architecture and Planning. The next steps in the process call for selecting the winners of the design competition. Rose-Burney, the land conservancy’s deputy director, expects the community choice award and the jury’s top picks to be announced sometime in May. Plans will then begin to develop conceptual and schematic designs for the trail, using ideas submitted during the competition. That process should start by the end of the summer and will launch what’s likely to be a yearlong process to craft a final design plan, Rose-Burney said. All during the process, community engagement events will be held and feedback will be solicited. Community engagement will be a key element in the project. Meanwhile, efforts to nail down an official name for the project – and the linear park – remain ongoing. The naming decision could come sometime over the next couple of months. The corridor’s first public event has been scheduled. On April 20, the Buffalo Audubon Society plans a spring migration bird walk. It’s the first of about 10 scheduled Audubon events along the corridor. Buffalo Niagara Waterkeeper plans a pair of summertime events tied to the corridor in the nearby Buffalo River. Other organizations such as Groundwork Buffalo, the Old First Ward Community Association and the Valley Community Association are also planning events. These types of partnerships will be important. So will financing. So far, close to $1 million has been raised, land conservancy officials said. Funds have come from BlueCross BlueShield of Western New York Blue Fund, M&T Bank, the Ralph C. Wilson Jr. Legacy Funds at the Community Foundation for Greater Buffalo, the state Department of Environmental Conservation, the Land Trust Alliance, and the Rails-to-Trails Conservancy, among others. The next phase – conceptual and schematic designs – will be funded through a $369,000 grant from the New York State Office of Parks, Recreation and Historic Preservation. These are the men and women who will judge the juried competition. Charles Davis II: Assistant professor of architectural history and criticism at the University at Buffalo. Ken Greenberg: Principal of Greenberg Consultants. 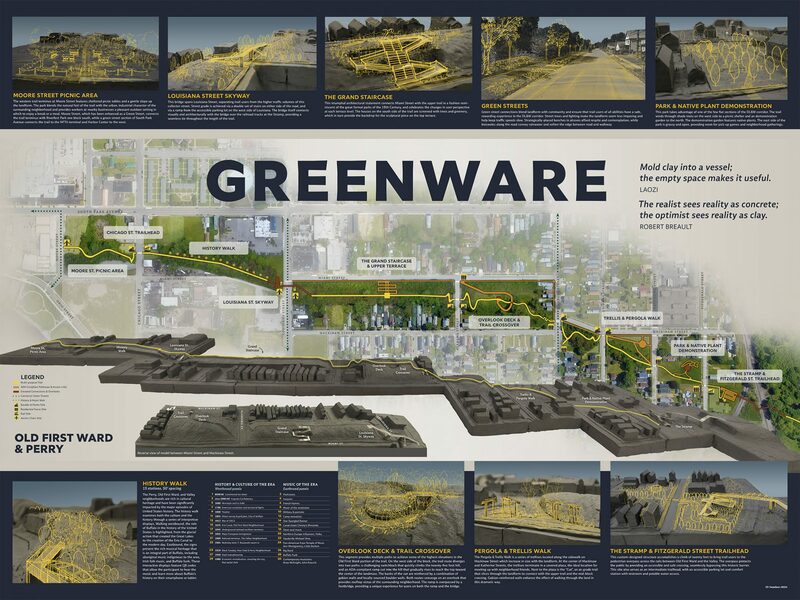 Helped launch and design the Bentway project in Toronto. Previously served as the director of urban design and architecture for the City of Toronto. Sara Heidinger: President of the Old First Ward Community Association. Photographer and co-owner of Undergrounds Coffee House & Roastery. Chris Reed: Founding director of Stoss Landscape Urbanism. Professor in Practice of Landscape Architecture and co-director of the Master of Landscape Architecture in Urban Design Program at the Harvard University Graduate School of Design. Robert Shibley: Professor and dean of the School of Architecture and Planning, University at Buffalo. UB campus architect and senior fellow at the UB Regional Institute. Janne Sirén: Director of the Albright-Knox Art Gallery. Previously served as director of Finland’s Helsinki Art Museum. Ana Traverso-Krejcarek: Manager of the High Line Network at Friends of the High Line.